Richard Rhys O’Brien’s third album in as many years delivers another intriguing mix on love, life and the contemporary world. Richard’s humorous as well as darker observations are delivered against multiple guitars, often dark bowed bass, tight rhythm, sparse piano and keys and a vocal delivery that ranges from the spoken to the ballad, supported by sparkling backing vocals. 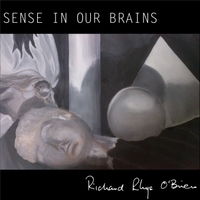 Produced by Matt Knapp, Richard’s third album Sense in our brains exploits the mix of talents that the band adds to his lyrics and unpretentious singing. Led by Bruce Knapp’s musical direction and multiple guitars, underpinned by the rhythm section of Richard Sadler on bass and Tony Shepherd on drums and topped off with Callie Howard’s backing vocals, this makes for another great and varied, thought-provoking, musical experience.